We strongly wish to serve you to the best of our knowledge and ability. Please read below information and do contact us with your query if any. We reply to all queries within few hours. What is IMEI? How to Find it? Also known as: “International Mobile Equipment Identity”. An IMEI is a serial number that uniquely identifies a GSM or UMTS mobile phone. Typically 15 digits long, the IMEI code is broken into sections that provide information about a phone, such as its manufacturer, to the mobile network that the phone is connected to. It is usually found printed on the phones back under the battery. It can also be displayed on the phones screen by entering *#06# on the phones keypad, as explained in below pictures. IMEI numbers of stolen devices are blacklisted in some countries so that the phone can not easily be used by a thief. 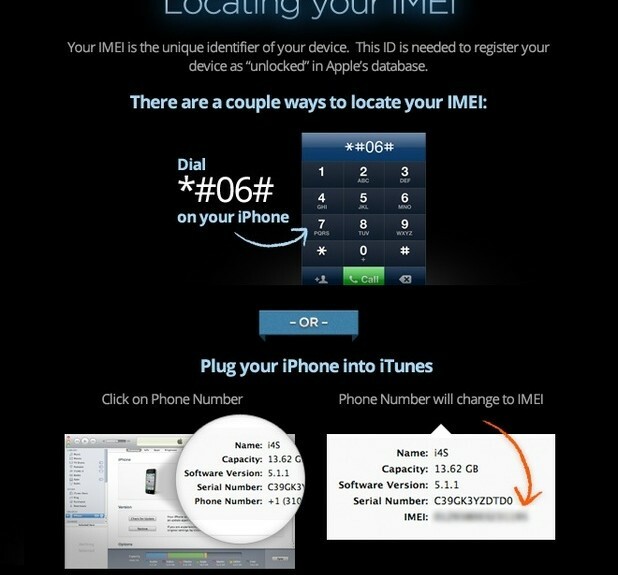 Described below are few possible ways to find IMEI of your iPhone. What is Factory or IMEI Unlock? As we wrote before, the IMEI (International Mobile Equipment Identity) is used to uniquely identify a mobile phone and every iPhone has got an IMEI number which can be found by typing *#06#. 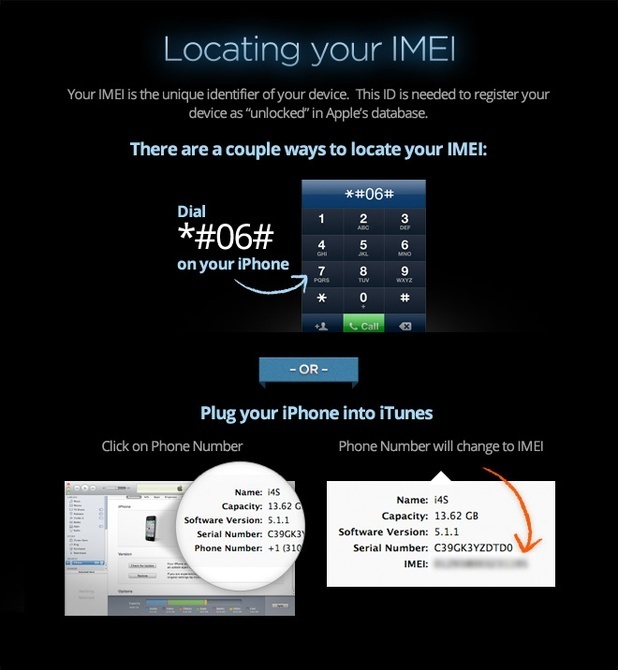 Apple uses the IMEI information of every iPhone to categorize them as locked or unlocked and this IMEI data is present on the Apple servers and is used when you connect your iPhone to the computer via iTunes. So if you are looking to Factory Unlock iPhone, you can provide your IMEI to the service provider and get it unlocked by adding the IMEI number to the Apple’s whitelist database. So the next time you connect your iPhone to the computer and open up iTunes, your iPhone will be unlocked. Once you get your iPhone unlocked it works similar to a Factory Unlocked iPhone and even the Apple warranty remains valid. This IMEI factory unlock method just requires your iPhone IMEI number and you are not required to get any iPhone IMEI Unlock Codes. Why Unlock? What are Benefits of Unlocking a Phone? When you purchase a cell phone it is often offered at a discounted price by the cellular network. In return for this generosity they “lock” your iPhone to their network, so that you can only use their network for making and receiving calls. This means that you cannot use the SIM card of another network. Unlocking the phone removes this lock, allowing you to use your iPhone on any GSM wireless network anywhere in the world. Factory unlocked phones have many benefits, which is why they are more popular than factory locked phones. The benefits of buying a factory unlocked phone include a higher degree of flexibility to change phones or cell phone providers, saving money, and staying away from contracts and hidden charges. One of the biggest benefits of a factory unlocked phone is the flexibility to change cell phone service provider when needed. The US is one of the few countries that give cell phone providers the option to limit consumers to a single provider by using a “locking system,” which ties the cell phone to a provider for a contract period. Factory unlocked phones give users a great amount of relief from this locking system by allowing them to change provider when they please. When a user is unhappy with the quality of service offered by a provider or is not happy with the customer service, he or she can switch cell phone service providers by simply changing to a SIM card offered by a different provider. A factory unlocked phone is the best choice for users who travel frequently to other countries because they can change their SIM card with relative ease when they travel. Most cell phone providers have international roaming charges if the cell phone is used in a different country than where the contract was signed. Therefore, to avoid these additional charges, users prefer to use a cell phone provider of the country they are traveling to. With factory unlocked cell phones, users simply have to change to the SIM card of the visiting country’s cell phone provider, which will eliminate roaming charges and help users retain the same phone wherever they go. This helps users use the information contained in their cell phone, such as contact details and personal information without having to switch this information from one phone to another when traveling between countries. Users can stop worrying about cell phone contracts and the restrictions that come with them when they use a factory unlocked phone. They can change cell phones or service providers at any time, without ever having to be concerned about penalties and charges that come with early termination of contracts. Factory unlocked phones help users save money in many ways. When cell phone providers increase their charges, users can simply switch to a provider that offers better rates for the same service. Additionally, by switching providers, users can make better use of the discounts and offers that different service providers offer from time to time as a part of their marketing strategy. Users can avoid all the hidden charges that come with cell phone service when they use a factory unlocked cell phone. Cell phone providers charge additional money for using certain services, such as data and text messaging when the phone is tied with their service. When they add such charges, users with locked phones have little to no choice and are forced to pay these hidden charges to continue to use the phone. A factory unlocked phone helps users avoid these charges because they can pay as they go or change providers if there are too many hidden charges. With locked phones, users are restricted to the software and applications provided by the service provider, but with unlocked cell phones, users can upgrade or change to the software they need. Unlocked cell phones also give users the flexibility to change cell phones if needed; to make use of technological advancements as they emerge. Since these cell phones are sold directly by manufacturers, they do not have any missing hardware or software, which enables users to make the best use of their cell phone. The resale value of a factory unlocked phone is higher because users can sell it anytime and to anyone, as the cell phone is not tied to a particular provider and the buyer can start using the phone right away. In addition, if the user is unhappy with the unlocked phone or just wants to upgrade to a better phone, it’s easy to sell the unlocked phone and use the money to buy a new one. This is a stark contrast to locked phones, where users cannot sell the phone until the end of the contract period. What Firmware and Basebands can We Unlock? This is a very common question being asked by many customers, IMEI unlock supports all iOS versions and all iPhone basebands. As we sell official carrier unlocks and not software hacks, what firmware and baseband of your iPhone you have is unimportant – we can unlock ALL firmwares and ALL basebands (including 04.11.08, 04.12.02, 05.16.05 etc. ), now and new ones which come out in the future. What is Clean / Barred / Blacklisted IMEI? Stealing and iPhone lost are two main reasons for why iPhone gets blacklisted. There are other terms that identify this; they are barring and blocking. If the iPhone is blacklisted by a carrier, it is impossible to use this handset on this carrier’s network. Mobile operators in some countries even share one database of registered devices, and if a gadget gets blacklisted in such a country, it will be impossible to use it with any local carrier. Factory unlocking process is very simple: Select the desired unlock service, use PayPal or a credit card to pay for it. Wait for the requested time to get a confirmation e-mail. The confirmation e-mail will contain necessary but simple unlock instructions on how to proceed further with your unlock & using your iPhone with your desired SIM. Open latest version of iTunes software on your Mac/PC with internet connectivity. Insert any SIM card other than original carrier and connect your Apple iPhone to Mac/PC using the USB cable. “Backup” your Apple iPhone via iTunes or iCloud ONLY if you want your apps, music, pictures, etc saved. Make sure that your iPhone is running the latest iOS, if not press “Update” button on iTunes to update your iPhone to the latest firmware. During this Process, iTunes will communicate with Apple Unlock Database. After updating, your Apple iPhone will restart. Keep your iPhone connected with iTunes. 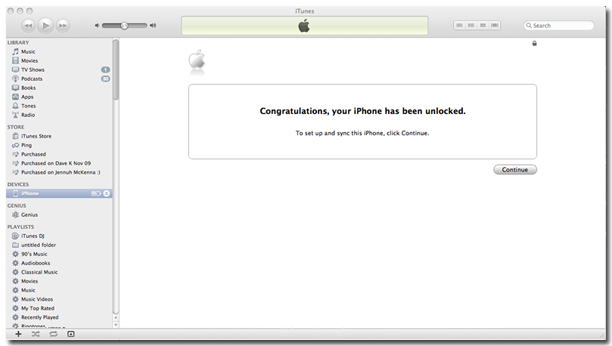 Wait until iTunes detect your iPhone, and once detected it will show “Congratulations, your iPhone has been unlocked”, as shown below. (Sometimes, this message doesn’t show up but don’t worry, your iPhone is still unlocked & will work perfectly with your new SIM). Remove your SIM Card from original carrier. Insert a GSM SIM Card other than original carrier. Your Android phone will prompt you to enter Network Unlock Code. Enter the code provided by us, once you entered your Code, your Android will been 100% Factory Unlocked!